What to consider and how to buy personalized stemless wine glasses. When it comes to personalization there is nothing like a custom wine glass for your special event. There is no secret that these are the most popular glassware favors for weddings. From fall leaves, hearts or nautical to monogrammed and anniversary milestone designs - customization is wonderful. 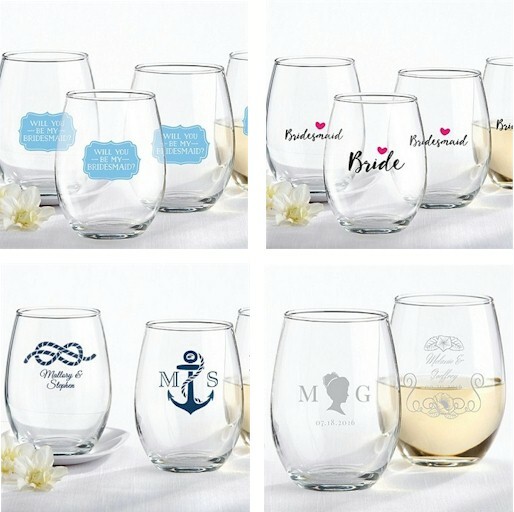 We especially love how motifs and initials look on these new contemporary custom wine glasses. The most common size for stemless wine glasses is either 9 once and 15 ounce. If they are not engraved then they are not dishwasher safe as they are either screen printed or pad printed. Most companies charge a setup fee for the glasses ranging from $30 to $40. This fee is basically for designing the printing template and setting up the printing machine. Today's technology makes it possible to have a design window where you can create your own design and actually see them before you place an order. How cool is that! Using personalize stemless wine glasses as your wedding favors is money well spend and leave a lasting memory of your event. You'll find them at WeddingFavorDiscount.com for less than $2.00. Start shopping now and have fun designing your glasses.